Our Partners in Kind (PIK) crew is still at it! We randomly visit local businesses, groups and organizations to spread goodwill! We all know it’s important to simply do a good deed just because ... but do we always act? Whether it’s buying beverages or providing snacks and refreshments for the patrons at a local coffee shop, a cafe, or even a handful of Rockford/Stateline area events, our PIK crew is out there to make you stop, smile, and enjoy your community! 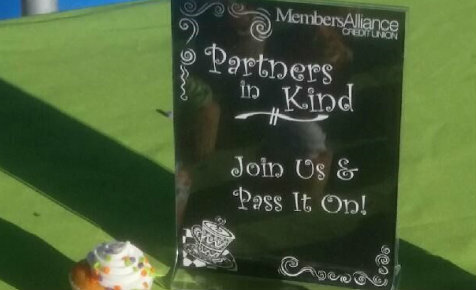 Partners in Kind is getting social! In addition to popping up randomly at local establishments, our PIK crew is going to Facebook! How would you like a gift card to a local business? We have started a Facebook Partners in Kind Initiative where we have Partnered with 12 local businesses to give away a $10 gift card each week to your choice of one of their establishments! ALL you need to do to enter each week is like our Facebook page that week. Once you've already done that just share one of our posts throughout the week and you'll be entered for that week too. In other words, you can enter every WEEK for FREE! Promoting goodwill, spreading good vibes, and encouraging you to join us & pass it on!